WEST LAFAYETTE, Ind. — Leslie Geddes, a Purdue University distinguished professor of biomedical engineering and recipient of the National Medal of Technology, died on Sunday (Oct. 25). He was 88. The Showalter Distinguished Professor Emeritus of Biomedical Engineering, Geddes created innovations ranging from burn treatments to miniature defibrillators and ligament repair to tiny blood pressure monitors for premature infants. Born May 24, 1921, in Port Gordon, Scotland, his family moved to Canada, where he earned a bachelor’s degree in electrical engineering in 1945 and a master’s degree in electrical engineering in 1953 from McGill University in Montreal. He earned a doctorate in physiology in 1959 from the Baylor University College of Medicine, where Ð among other accomplishments Ð he developed physiological monitoring systems for early astronauts. Geddes was recruited to Purdue in 1974 to help the university develop an organized biomedical engineering research center and create new technologies in the field, and his research and teaching laid the foundation for creation of a department of biomedical engineering in 1998. He received the 2006 National Medal of Technology from President George W. Bush in a White House ceremony in 2007. The award is the nation’s highest honor for technological innovation. His most recent discovery was a new method for performing cardiopulmonary resuscitation that has advantages when compared to standard CPR. In 2004 Geddes received Purdue’s Outstanding Commercialization Award to recognize his 30 patents, many now licensed by Indiana companies. Patents and technologies emerging from Geddes’ laboratory have generated more than $15 million in royalties for Purdue. He officially retired in 1991, when he was named distinguished professor emeritus, but he continued his teaching and research. An energy efficient miniature defibrillator – a device that jolts the heart with electricity during a heart attack – that is small enough to implant inside a person. A regenerative tissue graft made from a layer of pig intestines that has been used by surgeons to treat more than 200,000 patients so far. A pacemaker that automatically increases a person’s heart rate during exercise. 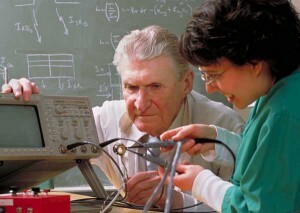 A portable electrocardiograph that patients use to monitor the electrical patterns of their own hearts. A miniature cuff that fits over the pinky-sized limbs of premature infants to measure blood pressure, heart and respiratory rates, and the amount of oxygen in the blood. A device that tells medical personnel whether they are properly administering cardiopulmonary resuscitation. The device could be crucial in saving lives because every minute of delay in resuscitation reduces the chance of survival by 10 percent. One-third of the $15 million in royalties goes into the university’s venture fund, which supports other research to develop new technologies. Indiana-based companies that have licensed and commercialized Geddes’ inventions include Cook Biotech Inc., DePuy Inc., Eli Lilly and Co., and Hillenbrand Industries. Geddes received many awards during his illustrious career, including the IEEE Edison Medal, the Engineering in Medicine and Biology Society Career Achievement Award, the Association for the Advancement of Medical Instrumentation Laufman-Greatbatch Award, and the Nelson Innovation Award. In 1962 he married Dr. LaNelle E. (Nerger) Geddes, and she survives. Also surviving is a son, James, two granddaughters and four great-grandchildren. In lieu of a funeral service, the family has asked that written stories celebrating Geddes’ life be sent to the Weldon School of Biomedical Engineering, Attn: Jo Gelfand, 206 S. Martin Jischke Drive, West Lafayette, IN 47907-2032. Memorial contributions can be made to the Dr. Leslie A. Geddes Scholarship Fund at the same address.